The GROHE Red Duo kitchen mixer delivers water heated to 99° instantly, perfect for a quick cup of tea, blanching vegetables or sterilising baby's bottles. It features an energy-efficient titanium M-size boiler that sits under the sink freeing up precious space on the work surface. The boiler provides up to 3 litres of kettle hot water at once while the in-built child lock and smart cool touch technology ensures safety for all ages. 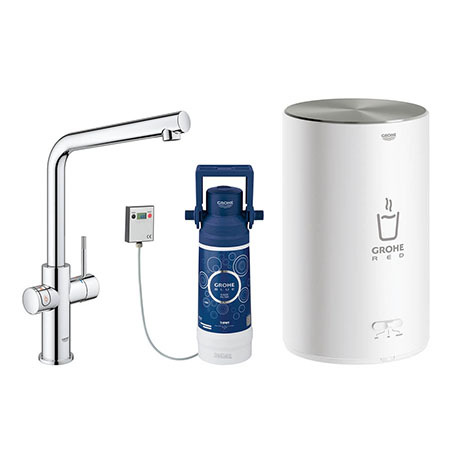 The tap features a GROHE SilkMove cartridge for smooth and effortless lever operation even after years of use and comes finished with GROHE StarLight chrome coating that is scratch resistant and easy to clean.